Do you want to play ladder ball like a pro? Learn the ladder ball golf rules and game etiquette, grab the top ladder toss game set, so that you can surprise all your adversaries on the field. It’s hard to imagine summer without backyard games. Among the many options out there, the ladder ball is a classic. It brings a simple and fun way to enjoy the outdoors with friends and family, majorly thanks to its simple rules. Also known as the ladder toss, this exciting game boasts a straightforward setup and consists of just a few pieces that are easy to carry around. These features make the game a preferred among campers since it’s so easy to take it with you wherever you go. Whether it’s a trip to your in-laws or a few days out in the wild, ladder ball can make your whole adventure even more enjoyable. That is, if you know how to play it and have a good set by your side. Luckily, the rules are easy to learn even by the kids, and the lawn game can entertain players of all ages. 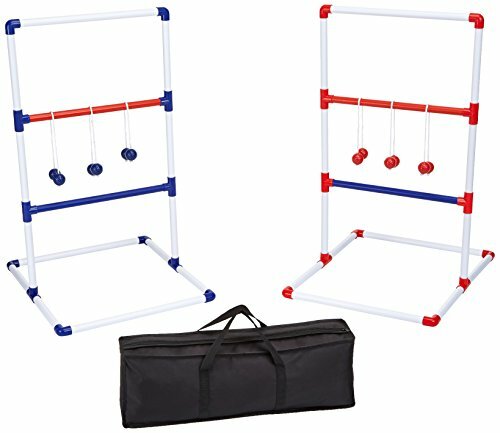 As for the set, we truly like the Basics Ladder Toss Set, which is easy to mount and safe to play by kids and adults alike. Undoubtedly the most important piece of the game, bolas refer to two golf balls attached to one another with a piece of rope. 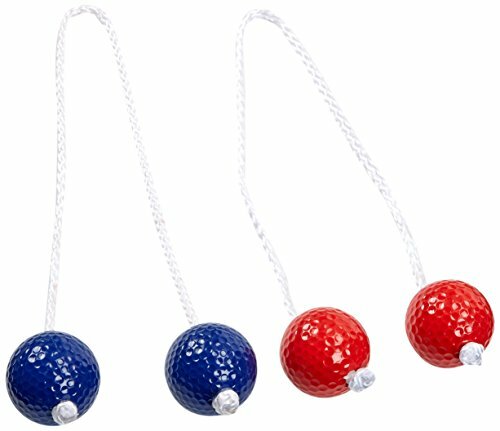 Two connected balls make one bola, and a game set usually contains six, three blue and three red, although other color pairs are also common. Is pretty intuitive and refers to the game ladder made up of the contraption with three steps. A game set has two ladders, although you will only need one if you decide to play by the classic rules. Also called rungs, are the actual steps of the ladder described above. They are defined as top, middle, and bottom rung. A line on the field, located at 15 feet away from the ladder. Players must toss their bolas from here; although the game rules require 15 feet, if you have a small backyard or need some flexibility, you can adjust this distance according to your needs. Now that we’ve got the terminology settled and you know what to expect, it’s time to learn how to play. The first thing to determine is whether you want to play against a sole adversary as single players or in teams. In the latter case, know that a team consists of four players who take turns at throwing their bolas. This game’s goal is to score 21 points exactly by wrapping bolas around the rungs. The simplest way to set up the game is by installing only one ladder and counting 15 feet backward. Draw a tossing line on the ground and toss the bolas from there, alternating turns either between players or teams. From the line, each player must throw their bolas and – hopefully – wrap them around a rung. Each player or team can toss three bolas per turn, and each turn’s scoring is completed when both players have tossed their bolas. To get to the 21 points mentioned above, players have to wrap their bolas around the rungs and score points. Three points for bolas on the top rung. Besides these points, you can also score one bonus point if you manage to wrap one bola on each rung in a single turn or if you wrap all bolas on the same rung in a single turn. However, just because you wrapped the bolas, it doesn’t mean you can add the points to the score. Your bolas must remain on the ladder until the end of the turn. If they are knocked off while the other player tosses their bolas, your toss doesn’t count towards the final score. To win the ladder ball game, you must score no more no less than 21 points. This rule makes the game more exciting, as players will have to build a strategy and keep an accurate track of their score. But the game doesn’t end when one player or team reaches 21. If the opponent hasn’t surpassed the threshold, the ‘winning’ party must give their adversary the opportunity to match their score. If they fail, the player who reached 21 is declared as the winner. If you want to bring more excitement to the game and make it last longer, you can establish a best of X series winning rule. For instance, the team who reaches 21 for three times wins the game. In the event of a tie, each player or team must play as many overtime rounds as necessary to gain two extra points at the end of the round. While the ladder ball golf rules above define the original game, nothing stops you to alternate and adapt the game to fit your needs. A common variation requires to setup two ladders at 25 feet apart and facing each other. Each team assumes its position next to one ladder and plays by throwing bolas towards to opposite ladder. This variation is very similar to the horseshoes game and is much more common among adult players. You can also change the game’s objective, especially if you’re setting it up for young kids who find it hard to reach an exact score of 21. In this case, the winner could be the player or team who scored the most points after a pre-determined number of turns. Like all lawn games, ladder ball is flexible and adaptable too. If space doesn’t allow you to leave a distance of 15 feet between the ladder and the toss line, you can simply establish a different distance. The word golf in the game’s name is a clear indication this lawn game comes with a solid etiquette – albeit it’s pretty different from what a gentleman could expect. Ladder ball, indeed, encourages loud sounds, remarks, yelling, and shouting. All these actions can be used to distract your opponent, and everything is allowed except touching a player or their bolas when it’s their turn. It is also against the rules and etiquette to walk to the ladder before each round is completed. It doesn’t matter how much you want to see how flawlessly you tossed your bolas, just wait until the other player has finished their turn. The objective of the game is to wrap the balls (which are attached by a rope with a ball at each end) around a rung of the ladder, each rung carrying a different point value (typically three at the top, two in the middle, and one on the bottom). Ladder ball golf rules are simple and straightforward, just what it takes to make it a fun and easy-going game to play with your buddies or family. Ideal for either kids or adults, the ladder toss can easily fill up the time as you’re waiting for your barbecue to be ready. what if your bola wraps around 2 rungs at once?